George is packing up the car as I type this. We're heading to Ohio for a long weekend. My niece is turning "1", and I'm glad we can be there for her first birthday party. She's so cute, I could just eat her up! I'm taking my new (old) purse with me. Isn't it a pretty one? Love those colors so much. And ...looky what came in the mail! It should be on newsstands very soon. I ran an ad for the shop in this issue, so I got an early copy. I'm sure it will make good reading material for this 7-hour drive. Also, just wanted to let you know that One Hundred Wishes will be closing for "renovations" this Monday. The shop will reopen on Thursday, sometime later in the day. I will have more updates for you next week. ohhh i am in there - hopefully its waiting in my mailbox for me !!! gotta go check !! Can't wait to get my hands on the new Life. Hope you have a great weekend! Have a really fun weekend!! Happy Birthday to your niece!! I will come back and visit your store. Nice to find you. This is a great issue! It's the lst time I've bought it. It's on my permanent list of "must haves" now! Have a great trip, Andrea. have a sweet trip! the new magazine looks great! cant wait for it to be on the stands.. Your post about the copying was an eye opener to me.. I had no idea how much of this goes on. I have seen two individuals blatantly copy and sell over and over on flickr and etsy..makes me wonder if I should say something to them, or the persons I think they're copying. I just stopped commenting on their things and wondered what others thought about it... oh well, its all too bad! but we must keep on enjoying the great wonderful people, creations and ideas that we find out here.. we cant let a few rotten eggs ruin things for us! well.. enough said for now.. I didnt even mean to go "there".. just wanted to say hi, comment on the book and say have a nice trip! 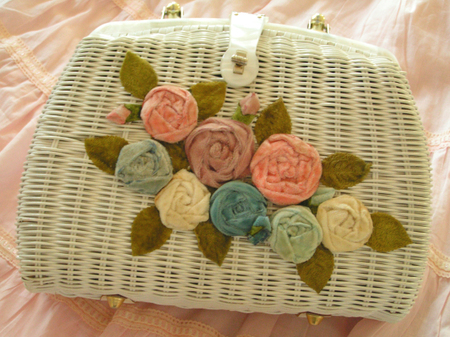 What a pretty purse! Have a safe trip. 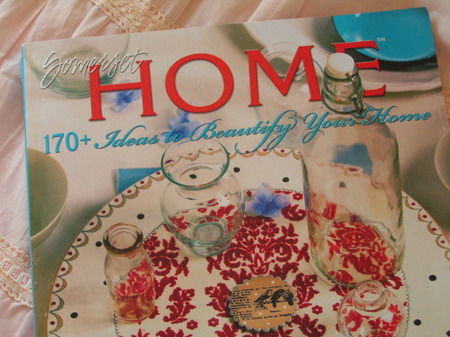 :) And that magazine looks tempting, I might have to check that one out! Oh, I know what I'll be doing tommarow! heading to paper muse to get one..they usually have them early! woohoo! I just found your blog and store through my friend, Kasey of Lola B's Boutique. I love what you said about being authentic, and I love your sincerity. It came right through your blog entry. I also love that little purse! Can't wait to read more! Lovely purse of handbag as we'd call it in the UK! Have a safe trip to Ohio. Enjoy your family and the time together. Wow, I do love the purse also! Have a great trip! Oh Andrea...I just love your bag. The roses add just the right touch of vintage! Love the purse. It's just great. The colors are perfect.